In this photo: Caitlin Berchtold, a junior DSU fisheries management major, and David Saveikis, director of the state Division of Fish and Wildlife, hold Senate Bill 220 after the House unanimously passed it on June 27. Ms. Berchtold proposed the legislation, which will create license plates of which the proceeds will benefit fisheries research and recreational fisheries. A DSU fisheries management student has used her passion for her major to help the state legislatively establish a new initiative that will result in new funding for fisheries science and recreational fishing in the First State. Caitlin Berchtold helped revive a proposal that had once died, but now in part due to her efforts has become a legislative reality – the creation of a fisheries-themed Delaware license plate, the proceeds of which will go toward the enhancement of recreational fishing. 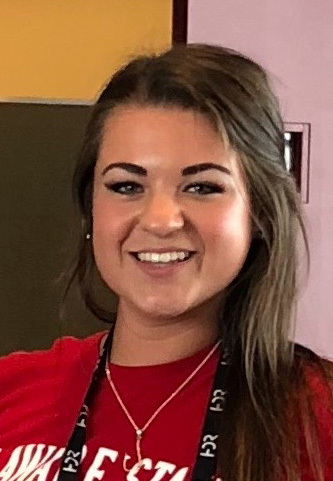 It began when Ms. Berchtold enhanced her fisheries studies by attending the state’s Advisory Council on Recreational Fishing Funding public meetings. During November 2016, as a member of the public, she proposed that the state create a license plate to bring in money for fisheries research, habitat restoration and fish stocking. Mr. Saveikis said that the DSU junior was an engaged member of the public who promoted the idea at the Advisory Council meetings. She added that she wanted to see something less broad that benefited only fisheries. According to Ms. Berchtold, she was unaware that her idea had been suggested a few years earlier. Ms. Berchtold’s enthusiasm for the proposal, joined by the efforts of the Advisory Council and the Division of Fish and Wildlife, gave the idea the legs that it needed to walk over to the Delaware General Assembly to be molded into a bill. State Sen. Gerald Hocker introduced Senate Bill 220 on June 1, which put the license plate proposal in legislative motion. He was joined in sponsoring the bill by Rep. Ronald Gray, Sen. Brian Pettyjohn, Rep. Jeff Spiegelman, Rep. Richard Collins, Rep. Harvey Kenton, Rep. Joseph Miro, and DSU alumna Rep. Stephanie Bolden. The bill passed the House and the Senate unanimously, and was signed into law by Gov. John Carney on July 11. “She had a vision and she was persistent,” said Mr. Saveikis. “She has a passion for fisheries science as well as recreational fishing, and she turned that passion into an idea. Upon the bill passing the House, Rep. Ronald Gray thanked Ms. Berchtold for the instrumental role she played in moving the proposal forward. 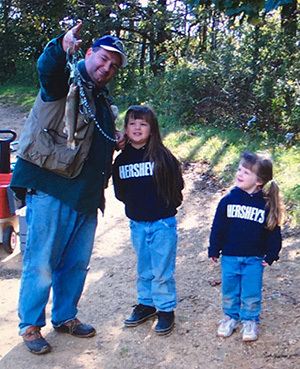 The DSU junior said she got her love for fishing from her father, Brian Berchtold. According to the enacted legislation, the license plate will cost $95 – from which $15 will go to the state Division of Motor Vehicles (DMV) to cover administrative costs, while the remaining $80 will go to the newly created Delaware Recreational Fishing Enhancement Fund. Currently the DMV, the Advisory Council and the Division of Fish and Wildlife are working toward two plate designs – one with a freshwater theme and the other reflecting a saltwater theme. Apparently the fishing waters of Delaware are just fine for Ms. Berchtold. Slated to graduate in December 2019, she hopes to remain in the First State and become a fisheries biologist at the state Department of Natural Resources and Environmental Control.